Richard Holzschuh is the classic case of a forgotten artist rediscovered. Several years ago, I received an unusual telephone call from someone then unknown to me, James Hogan. He told me that his late stepfather liked to draw and that he was looking for a museum that might want his drawings. Hmmm, I thought, “is this going to be awkward?” Well, you cannot win if you do not play; so, I made an appointment. Mr. Hogan arrived at the museum carrying a notebook or two containing photos of his stepfather’s work. I opened the cover and was pleasantly surprised to find a skillful and charming fairytale illustration. With each turn of the page, I encountered marvelous drawings of gnomes, animals, anthropomorphic trees, nursery rhyme characters, children, and wizened elders—all whimsically yet meticulously rendered. The experience was astonishing, quite emotional. Richard Holzschuh was completely unknown to me, and here I was entranced by dozens of his drawings. Mr. Hogan, who soon became Jim to me, not only offered to give the museum the drawings and watercolors that he had inherited from his stepfather, he also recruited other family members to join him in his generosity toward Mia. Together they donated, drawings, watercolors, pastels, prints, printing plates, and background material that helped flesh out our understanding of Richard Holzschuh’s creative life. I organized a kid-friendly exhibition of Holzschuh’s drawings. Mia published an activity book based on his drawings, and put photos and information about the collection online for all to see. People fell in love with his drawings. Some still recall their memories of the show to me, and others comes to explore the collection in Mia’s Herschel V. Jones Print Study Room. Though not exactly famous, Richard Holzschuh was no longer forgotten. I’ve been searching for years for info about Richard Holzschuh but been unsuccessful until finding your website. I found the attached drawing in a house I purchased in 2000. My son, who has studied German, tells me that it is an illustration for a poem by Goethe called Erlkoenig. In the same note, she offered to donate the drawing to Mia. I was touched by Mrs. Thompson’s generosity and impressed by her son’s knowledge of Johann Wolfgang von Goethe’s poetry. I don’t know if I would have managed to identify the subject of the drawing. 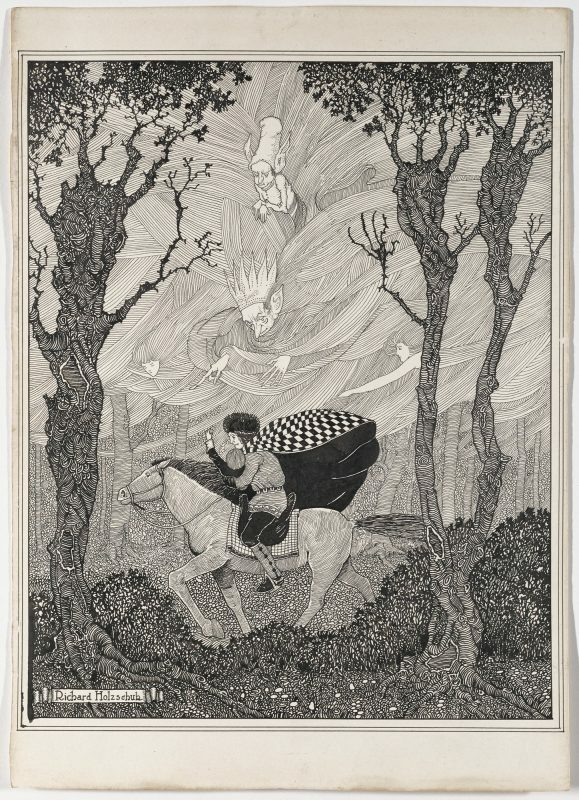 By the way, Holzschuh’s image makes Goethe’s dark story a little easier to swallow. But now I had a new mystery. Where had this drawing been? Marsha Thompson had some of the answers. When we bought our house [in the village of Waterford, Virginia] in 1995, the little cottage next door was rented out. We asked the owners to contact us if they ever wanted to sell it. We only saw the renter, Mr. Deargrov (not sure of the spelling) about 5 times in 5 years. He only came on weekends, stayed at most a couple of hours and then left. He never stayed the night. In 2000, the owners called and said their renter was moving out and they would sell it to us. 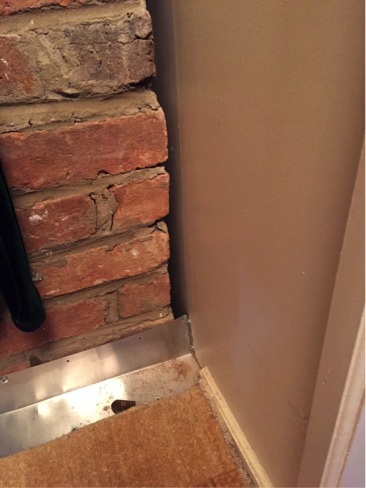 After we closed on the property and while we were painting the interior, my husband found the drawing in a broken frame stuffed behind the chimney (photo enclosed). I thought I might reframe it, but although it was beautifully executed, I found the subject matter disturbing and didn’t want it hanging on the wall. Every once in a while I would check the web to see if I could find out anything about the artist. I finally found your website this year. The story was so interesting that we felt the proper place for the work was with MIA. Mrs. Thompson sent along pictures of the cottage and the spot where the drawing had been stashed. The print had been stashed behind this fireplace in the cottage, and forgotten. A little sleuthing turned up David Dyregrov of Washington, D.C. Over the telephone, he related the earlier history of the drawing. He and his parents lived in Edina, a suburb of Minneapolis. His mother, Marie, was a good friend of Richard Holzschuh. She commissioned the drawing from the artist as a present for young David around 1945, about when he was headed off to junior high school. Decades later, he took it to his retreat in Waterford. When the frame broke, he must have stashed it behind the chimney and forgotten it when he departed. Though he misses the drawing, Mr. Dyregrov is pleased to see it go to Mia. I promised to send him a good photo of the drawing, and the Hogan family requested one, too. As for Mia, we are delighted to add this illustration of Erlkoenig to the Holzschuh collection, where it will be forgotten no more. So, you never know where art will turn up. Maybe you should check behind the hearth. Top image: The cottage in Virginia where the lost Holzschuh print turned up.